The graphs by Troy and Sen may be surprising in their starkness, but the density divide has been apparent in American politics for a while now. In 2012, Barack Obama carried 49 of the 50 most densely populated counties or county equivalents and (he narrowly lost California’s Orange County) and won 36 of them by at least 20 points. New York County (Manhattan) voted 84 percent Democratic, up from 80 percent when Bill Clinton was re-elected in 1996; San Francisco was also 84 percent Democratic, up from 72 percent in 1996. Obama won several competitive states largely on the strength of landslide margins in urban centers, including Philadelphia (85 percent) in Pennsylvania, Denver (74 percent) in Colorado, and Cleveland’s Cuyahoga County (69 percent) in Ohio. But there are some deviations from the norm. The densest county that didn’t give Obama a landslide was Richmond County, or the borough of Staten Island in New York City. Obama got a bare 51 percent in this overwhelmingly white, home-owning, middle-class area, a far worse showing than in the rest of New York City. On Staten Island, Romney proved that a Republican could indeed get a considerable number of votes among people who can see into their neighbors’ windows. Richmond County will be taking part in a mayoral election this November. One poll gives the Democrat nominee, Bill de Blasio, has a 40-point lead over Republican nominee Joe Lhota. (The poll did not have a separate result for Staten Island.) Lhota, the former head of the Metropolitan Transit Authority, is a credible candidate, and he’s running against someone who wants to raise the city’s income tax on wealthy individuals and has a history supporting the Sandinista movement in Nicaragua. These attributes should not prevent him from winning the city overall, but Staten Island? If I were a top Republican strategist, I would open a temporary office on the “other side” of the Staten Island Ferry to see what issues and themes resonate in the party’s outlier province. How do voters there feel about the federal government shutdown and the implementation of Obamacare? Are they more concerned with improving public transit or fighting crime? 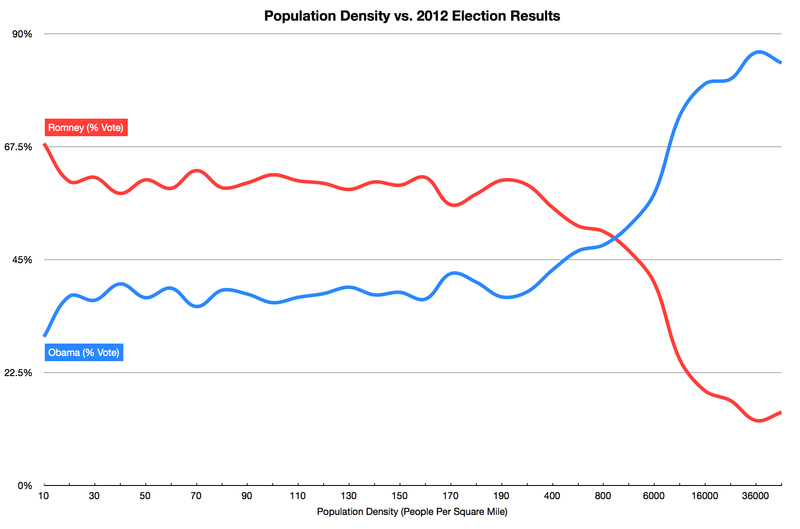 In 2012, the GOP was able to win the U.S. House (despite getting fewer votes) by dominating rural and exurban areas, but the national electorate is growing denser, or more urban, by the year. Manhattan and San Francisco may be out of reach, but Republicans will need to remain competitive in filled-in places like Staten Island. This fall, there are also gubernatorial and U.S. Senate races that include Bergen County in New Jersey (26th densest county, and a former Reagan stronghold that voted 55 percent for Obama in 2012) and a gubernatorial race that includes the city of Manassas, Virginia (24th densest, and a Reagan landslide site that voted 56 percent for Obama). In due course, even red states like Georgia will see suburban areas become as crowded as much of the Northeast. The Republicans need to move that tipping point to stay competitive. Graph from Dave Troy. Election data from the Atlas of U.S. Presidential Elections.